The Hostal is in the old town, in the well known Barrio de Las Letras (Literary Quarter), also called the Muses Quarter. Walking through the streets of this quarter allows visitors to know part of Madrid's history and the life of some of its famous residents. 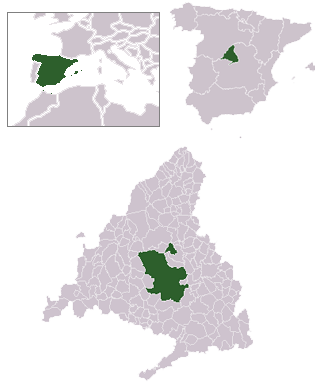 The most important Spanish Golden Age writers such as Cervantes (who is buried in the Convento de las Trinitarias located in this district), Lope de Vega (whose home is a museum at present), Quevedo or Góngora lived in this district. In more recent times important writers met at literary gatherings held in this district at places like the Royal Academy of History, the Atheneum and the Teatro Español. But in the district there also lived artists, politicians and some of the nobility. The district is a mixture of tradition, Golden Age splendor and modern Madrid. First light in Madrid today was at 4:23 am and sunrise was at 5:27 am, sunset will be at 7:00 pm and nightfall will be at 8:03 pm. You opened this page at 8:30 am (that's @395 Internet time) on Saturday the 20th of April, 2019. Local time is UTC which is UTC +00:00. 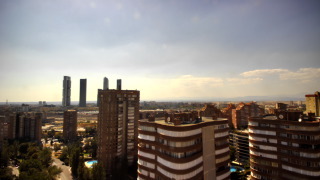 Madrid Skyline has a real time high definition view of the sky over Madrid, plus current weather information. Current European Satellite Image (Meteosat). Madridman. An excellent webpage about Madrid and Spain. Yahoo's page about Spain. A complete source of information about Spain. Si, Spain. Information on Spain originally provided by the Spanish Embassy in Ottawa.